Mmmm yummy milkshake on a gloomy day! Thanks to Steph for getting me this when I was too lazy to walk out of the building! Got to love that girl for always knowing what I crave! (If you’re reading this, I mentioned you again! 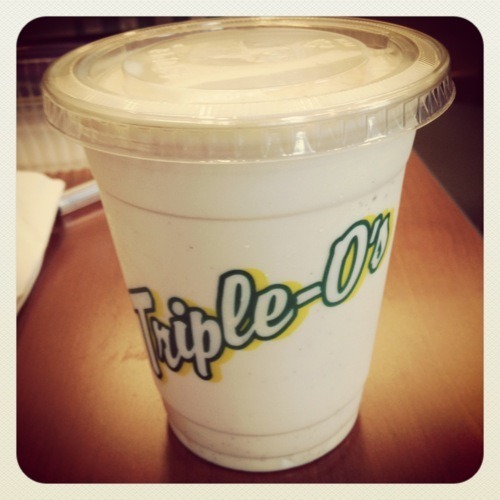 :D) The Triple-O Vanilla Milkshake is probably one of my favourite milkshakes so far. So much better than the McDonald or Dairy Queen milkshakes! It’s thick and creamy, and you can taste the vanilla bean which doesn’t taste artificial. I believe it also comes in strawberry and chocolate flavour.